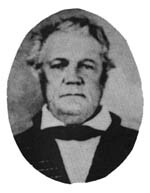 The Dahlonega Branch Mint was still under construction in January of 1837 when Dr. Joseph J. Singleton, a former state senator from Athens, Georgia, was appointed to be the mint's first superintendent/treasurer. Shortly afterward, Dr. Singleton made the long trip to Philadelphia to take the oath of office and sign his bond. Ironically, the document showing he had taken the oath of office was subsequently mislaid, and he was informed that he would have to take the oath again. He did not have to travel all the way back to Philadelphia, but he did have to make a 600-mile round trip to Savannah to find the nearest federal judge. When Dr. Singleton arrived in Dahlonega in late March of 1837, he found the "Mint Edifice" nearing completion but still lacking a roof. Nevertheless, he advised the Philadelphia Mint to go ahead and send the machinery. "Our anxiety to commence coining of our metal is fully equal to its value," he wrote to Dr. Robert Patterson, director of the Philadelphia Mint. Fifteen crates were shipped aboard the brig "New Hanover" and arrived in Savannah on April 22. The boxes were then shipped up river to Augusta, where they were loaded on a convoy of ten wagons bound for the tiny village in the mountains of north Georgia called Dahlonega, a name derived from the Cherokee word meaning "yellow" or "golden." The shipment was delivered in late May, but it was three months later before skilled workmen arrived from Charlotte to begin installing the equipment. Included in this or in some subsequent shipment from Philadelphia was a door knocker cast in the shape of the Great Seal of the United States of America. The bronze eagle was mounted on the front door of the Mint Edifice to announce the presence of visitors to the establishment. From the time of his arrival until the first coins were minted on April 17, 1838, Dr. Singleton stayed busy overseeing the completion of the building and the installation of its machinery. His patience was frequently tried with the problems of getting supplies delivered to a remote and barely accessible frontier outpost, as well as coaxing balky machinery to function properly. The mint began its operations using hauled water for the steam engine that powered the presses because the water pump could not be made to work. Dr. Singleton was ecstatic when the first 80 five-dollar gold pieces known as "half-eagles" were finally minted. "I believe our coin equal to any made in the world, both for its beauty and accuracy in its legal parts," he proclaimed. These first coins were slightly different in color from those minted in Philadelphia, however, because they contained nearly the legal limit of silver alloy permitted. The faulty pump had necessitated hauling water to wash the gold, so the assayer had refined no more than necessary and had substituted as much silver as the law allowed! Singleton was frequently called upon to settle conflicts between his temperamental employees. He also had problems with some of the local citizens, including Dahlonega postmaster, G. K. Cessna. Because of the "peculiar and disagreeable relationship between the Post Master at this place and myself," Singleton refused to use the Dahlonega post office for the first six months the mint was in operation. He required all mint correspondence to be handled five miles south of Dahlonega at the Auraria post office despite the inconvenience and the delays this caused. In addition to ongoing problems with the equipment and the building (the zinc roof leaked and had to be replaced---twice), the Dahlonega Branch Mint faced an even greater challenge: a dwindling amount of gold being presented for coinage. Most of the "easy gold" in the area had already been panned, and some thought the deposits were exhausted. In January of 1839, not a single coin was minted. "I wish we had more to do," Dr. Singleton lamented. There was even talk that the newly-opened mint might be forced to close. While wrestling with all these problems at the mint, Dr. Singleton was also overseeing the construction of a house for his family. It was located on a gentle hill overlooking the town with a commanding view of the hill upon which the Mint Edifice was situated. 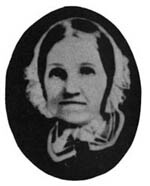 Joseph and Mary Ann Singleton raised five children of their own and also two orphans whom they adopted. The Singletons were noted for their kindness and charity to those less fortunate. Unfriendly political forces caused Dr. Singleton to be removed from his appointment at the Mint in 1841. He was charged with incompetence but was later vindicated when the Lumpkin County Grand Jury studied the charges brought against him and found them to be "gotten up for malicious and selfish purposes." Dr. Singleton�s involvement with gold extended beyond coinage. 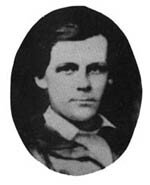 He had extensive gold mining interests in the area including the Singleton Mine, and consequently he and his family continued to live in Dahlonega after he left the Mint. He took over the operation of the famed Calhoun Mine in 1847, and it has been said that he and John C. Calhoun were "in all probability the largest producers of gold in the region." When gold was discovered in California in 1848, Dr. Singleton was reportedly eager to join other local miners headed west, but his family persuaded him to let Joseph, Jr., go instead. The younger Singleton did not find gold on a large scale, but, unlike many others who died en route, returned home safely to his wife Francina, his son Micajah, and a daughter named Mary Eliza, who had been born while he was away. Miners returning to Lumpkin County from the western gold rush brought not only California gold to be minted in the Dahlonega Branch Mint but also the technique of hydraulic mining. Cannons blasting great jets of water against the hillsides could quickly wash away trees, rocks, and dirt to reveal gold buried deep in the earth. It was common to estimate the work of a water cannon as equal to the labor of ten men. In order to bring water to the mines with sufficient pressure to power these "giants," the Boston-based Yahoola River & Cane Creek Hydraulic Mining Company proposed to create a 14-mile aqueduct consisting of open ditch, cuts, and flumes carried over trestles. Joseph J. Singleton, Jr., was made civil engineer for the project. Hopes were high for the project, which was well under way when it was halted by the same calamity that shut down the Dahlonega Branch Mint: the outbreak of the Civil War. Discontinuation of U. S. Mail service severed communication between North and South and cut off funds to pay salaries of both mining and mint employees. The Confederate Congress took control of the Dahlonega Mint but closed it on June 1, 1861. Dr. Singleton did not live to see these developments. He died April 9, 1854, and the Singletons� fine Colonial home burned sometime prior to 1856, destroying many letters and documents having to do with Dr. Singleton�s involvement with the Dahlonega Branch Mint. Following the war, the Mint Edifice stood empty for a number of years before being donated for use as North Georgia Agricultural College in 1873. The building was destroyed by a disastrous fire in 1878, but a new college building was soon erected on the original hand-hewn granite foundation of the Mint. In the early 1880s, Prof. Joseph J. Singleton taught mathematics and astronomy on the same site where his father directed the production of gold coins forty years earlier. Sometime after the Dahlonega Mint was closed in 1861, the brass door knocker mounted on the front door was removed and sent to the New Orleans Mint, where it was used until that mint closed in 1909. The superintendent of the New Orleans Mint acquired the knocker at that time. Some years later on a visit to his personal physician, Dr. Herschel W. Bass, of Gadsden, Alabama, the mint official learned that Dr. Bass's wife was the great-granddaughter of Dr. Joseph J. Singleton, the first superintendent of the Dahlonega Mint. On a subsequent visit, he brought the door knocker with him and presented it to Susan Singleton Bass, saying that the artifact belonged in the care of Singleton descendants. The knocker was passed down to Dr. and Mrs. Bass's daughter, Francina Bass Perott, when she and her family moved to Georgia "because it came from the Georgia Mint." On June 19-20, 1998, numerous descendants of Dr. Singleton traveled to Dahlonega to hold a family reunion and see the places where their ancestor had lived and worked. Among those attending were Francina Bass Perrott and her daughter, Susan Perrott King. They brought with them the historic door knocker from the Dahlonega Mint. Before the fascinated gaze of all present at the reunion, Susan King carefully unwrapped the handsome brass knocker and held it up for all to see. 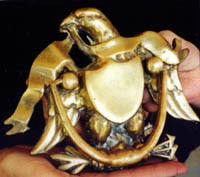 About seven inches tall, it is a reproduction of the Great Seal of the United States of America, showing an American bald eagle holding the arrows of war and an olive branch of peace in its talons. It seems likely that federal employees sent to the Dahlonega Mint at the end of the Civil War to remove its machinery and other equipment would have taken the door knocker as well. The deep grooves in the back of the knocker appear to be charred, however, strongly suggesting that it may have been still mounted on the front door when the Mint building was destroyed by fire on December 19, 1878, only a few months after North Georgia Agricultural College held its first graduation. 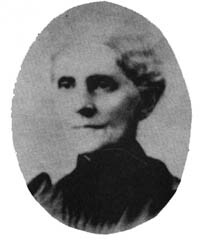 Susan King related that when she was a child, the knocker had been mounted on the front door of their home in Columbus, Georgia, and required regular polishing to keep it shiny. Now that more of its significant history is known, the treasured artifact is carefully stored in a safe. "My mother gave the knocker to me when my family and I moved back to Georgia for the same reason her mother gave it to her years ago," Susan explained. "They both felt that since it came from the Dahlonega Mint, it belonged in Georgia. When I saw the photograph of the old Mint in the Gold Museum, it really gave me a feeling of awe to realize that this same knocker once hung on the front door of that historic building and that my ancestor, Dr. Joseph J. Singleton, must have touched it many times." Author's Note: Much of the information relating to the Dahlonega Branch Mint which appears in this article was researched by Sylvia Gailey Head and Elizabeth W. Etheridge and published in The Neighborhood Mint; Dahlonega in the Age of Jackson (Mercer University Press,1986).